Hello, my name is Sarah, i'm almost 18 and this is the story of how I rescued my Beardie. I was in California in the summer of 2010, I was staying with Aunt(#1) had called my Aunt(#2) to see if I could go over there to spend some time with her before I had to leave to go back home and my Aunt(#2) (His previous owner) offered for me to take him back home with me to Washington state. She had gotten him from my other Aunt(#3) when that Aunt(#3) had to move, anyway moving on, she had had him for about 4 years before that summer. So after she said I could have him I called my mom and after some begging and pleading she laid down some conditions for me to have him and I agreed to them. So my Aunt(#1) took me over to my other Aunt's (#2) house and when I was there I saw how bad he was. He was so thin and weak that he couldn't even hold his head up. My Aunt(#2) offered for me to pick him up the weekend before I would leave to go back home, but I knew that he needed me to take him then, because he wouldn't survive another week if I didn't help him right away. So I talked to My Aunt(#1) and she said that it would be okay. So at the end of the day when I had to go back to my Aunt(#1, we packed up his cage and as soon as we got back to her house and got the cage unpacked and set up I got one of my cousins to help my force feed him. It was hard becase he would try to spit the food back up, and I would force it down. So after he ate some Mealworms and a few pieces of small Collard Greens I put him on the heat rock in his cage and put some more food in a bowl for him by the heat rock. I stayed up as late as my body would allow me that night before I was forced to sleep because I couldn't keep my eyes open. By the time i got up the next day around 11:30 my aunt was already up and said that he'd eating on his own and holding his head up. I was so happy. But I knew that that was just the begining and that he had a long road of recovery ahead of him as did I. It's now almost a year later and he is doing great. He is running around his cage and loves to back in my windowseal with my 2 and a half foot Iguana. He's very alert to what is around him and loves to be held and go outside when it is sunny and warm. He also loves it when he gets to take a bath. 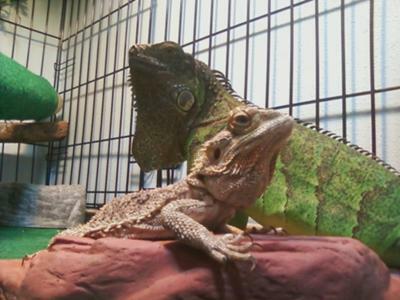 I wouldn't house iguanas and bearded dragons together. I would think the iguana would attack the dragon. Do iguanas and bearded dragons do good together?